MUMBAI: A 4.4-foot-long marsh crocodile was rescued from a drain near a construction site in Mumbai’s eastern suburb of Mulund late on Sunday, reported Hindustan Times. It took forest officials and animal rescue groups around seven hours to coax the reptile, which weighed around 8.8 kg, into the nets and haul it out of the drain. The crocodile was first spotted around 3 pm on Sunday by residents of a housing complex, who called the Resqink Association for Wildlife Welfare (RAWW). “We reached Aristo construction site in Mulund (west) and located the crocodile,” said RAWW President Pawan Sharma. Crocodiles are found closest to Mumbai in Tulsi and Vihar lakes inside the Sanjay Gandhi National Park, located within the city boundaries, and in Powai Lake. This is not the first time they have been spotted out of their territory, but usually, they are found out of their areas in the monsoon, during floods. A 15-member team, including RAWW and Mumbai forest range officials, were involved in the rescue operation. “Our team surveyed all possible exit points for the reptile from the drain and secured them. We used halogen lights to identify its exact location, and water pumps to reduce water levels before pulling it out,” Sharma said. 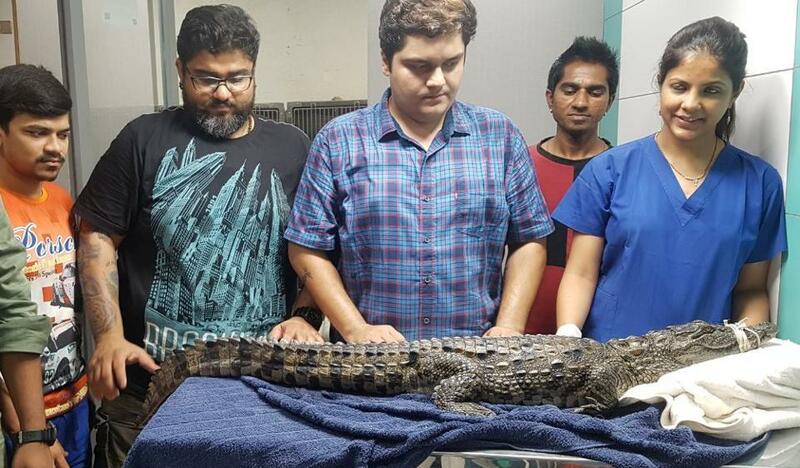 The crocodile was examined by forest department-recognised veterinarian, who identified it as a five to six-year-old male marsh crocodile. “The reptile was declared fit for release in the wild and the veterinarian has clipped it for future identification,” Ramgaokar said. On Monday, the RAWW team and forest officers released the crocodile into its natural habitat, Ramgaokar said, adding that the location would not be disclosed for its protection.